Gareth: "The landscape of North Lake, Prince Edward Island is my most important inspiration. I go there every summer and feel a very deep connection to this place. There is something very special, even archetypal, about the fields, skies, grasses, red earth, rolling hills and storms of PEI. When I paint that landscape it speaks about something beyond the particularity of the place itself. It inspired the seven year ongoing photography series Cumulonimbus 2008-2013 and the majority of the small "Lament" paintings. Photo by Gareth Bate, North Lake, Prince Edward Island. Gareth: "Gregorio Alegri's Miserere and Thomas Tallis' Spem in Alium are the most beautiful and inspiring pieces of music I've ever heard. My greatest aspiration is to make an artwork that can do that. I especially love the version Miserere a nove voci, baroque version with ornamentations by Bernard Fabre-Garrus. The piece was originally performed during holy week in the Sistine Chapel since 1514. Although I am totally non-religious I often find the aspirations of religious music and art very inspiring." Video: Nice version by Boys Air Choir directed by Connor Burrowes. Gareth: "Although I'd heard this piece of music before, it was Canadian artist Janet Cardiff's sound installation The Forty Part Motet at the National Gallery of Canada that really captivated me. (See below). This is such a sublime piece of music. Miraculous. I was lucky to see a live performance by the Toronto Consort and the Tallis Choir at Trinity St. Paul’s Church in Toronto." Gareth: "I have a great love of Toronto's neighbourhoods. They are lively, unique and diverse. Toronto is a city best experienced on foot. It works brilliantly in so many ways and has massive potential. My favourite neighbourhoods include the Annex, Queen West West, Kensington Market, Spadina & China Town, Bloor West and the Danforth. I have no tolerance for Toronto haters." Photo by Gareth Bate: Kensington Market. Toronto. Gareth: "When I saw this huge drawing at the National Gallery in London I thought, that is the most beautiful thing in the world. It is so powerful that it has to been seen in real life. It is amazing to me that a human being could make that." 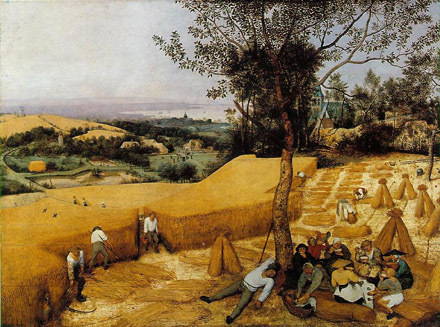 Gareth: "On my first visit in 2004 to the Metropolitan Museum of Art in New York I was floored when I came across Breugel's The Harvesters. It is my favourite painting. I found it incredibly moving and beautiful. It is the kind of painting that must be seen in person. The composition is remarkable. I realized at that moment that I wanted to make paintings that made people stop, paintings that were silent and filled with a serene quality. I don't think I actually do that, but it is an aspiration. For me the appeal of the painting has nothing at all to do with the figures. I don't even see them. The amazing thing is the circular structure and mood." Gareth: "On my second trip to the Metropolitan Museum of Art in New York I discovered Chinese painting for the first time. It blew my mind. I was struck by its power through simplicity, incredible depth and resonance, and by the fascinating shifting perspectives. I am particularly attracted to Sung Dynasty painting and handscrolls. The shifting perspectives of Chinese painting inspired my painting Orange Walking for Miles. The use of "voids" continually resurfaces in my work." Gareth: "John Brown is a very well known Toronto painter and also a friend of mine. He was my neighbour at 401 Richmond. We frequently have very interesting conversations (rants) about art and politics. I particularly admire his dedication and boldness. It is fascinating to watch the process of these paintings unfold over many months. It is a dramatically different approach to painting than my own." Photo: Gareth Bate, Olga Korper Gallery, Toronto. Gareth: "I recently went on a pilgrimage to visit Walden Pond in Concord, Massachusetts. This is the site where transcendentalist Henry David Thoreau built his cabin and wrote Walden. It was such a beautiful place despite being a bit spoilt by the loud family beach. It’s hard to say what I love so much about Walden. It is a philosophy book in the disguise of a personal journal. I find his observations about politics, society and nature very compelling. " Photo: Gareth Bate, Thoreau's Cabin Reconstruction, Concord, Massachusetts. Gareth: "I first experienced this piece in April 2012 at the National Gallery of Canada in Ottawa. It is spectacular. It was set in the chapel and featured 40 speakers, each representing one voice in a choir singing Thomas Tallis' stunning Spem in Alium. The sound sculpture can be experienced as a whole, or by standing next to each speaker and hearing the individual parts." 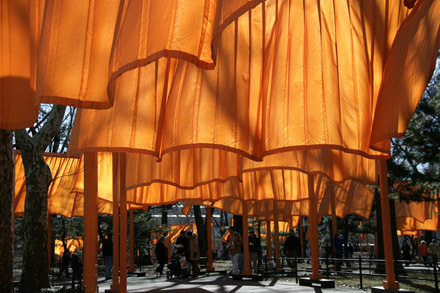 Gareth: "I was lucky to visit Christo & Jeanne-Claude's The Gates Central Park in 2004. It was an amazing experience that I will never forget. A profound gift. It was like walking around inside a giant painting. On the second day I was there we had a blizzard and Central Park was blanketed in snow. That was The Gates at its best. It inspired my painting Orange Walking for Miles." Gareth: "When I visited the Harvard Museum of Natural History in Cambridge, Massachusetts I was blown away by The Harvard Glass Flowers collection. The 3000 models were created by German father and son team Leopold and Rudolph Blaschka. They started in 1886 and spent five decades creating the 830 plants. My first impression was just being stunned that such a room could even exist, that anyone could have made these. Then you start to grasp that they are all made of glass! The intricate subtlety of them is what’s so remarkable. While there, I thought that there is no better way to spend a life." Gareth: "If there is an artist I wish I could be it would be Andy Goldsworthy. I would love to live that kind of life with a real connection to nature. But at the moment I have no idea how that could happen. The documentary about him called Rivers & Tides is incredibly beautiful and inspiring. I am especially attracted to the idea of making work outside in nature as opposed to the studio." Video: Scene from Andy Goldsworthy: Rivers & Tides. Gareth: "I’m already in love with Christian Marclay’s epic 24 hour film that pieces together clips from the history of film to create a giant multi-layered experience of time. Every scene in the film is either a moment in a film that features a clock, or discussion of time. The film runs at the exact time of day that you are watching so the film is itself a giant clock. It’s hard to figure out what is so compelling about this film, I think you’d have to watch the whole thing over and over to figure out all its layers of meaning. So far I’ve seen 8 hours of it, from 2:00 to 5:20 am and 10:30 am to 3:00 pm at The Power Plant in Toronto." Gareth: This famous speech sums up a lot about how I feel about the world. Let's get some perspective! Gareth: "This has been called the most important photograph ever taken, and I would agree. For 18 days the Hubble Space Telescope shot a single long exposure of a patch of sky that appeared to be completely empty. The result is incredible. This is not a photograph of stars, everyone of those points of light is an entire galaxy! Each one is composed of millions of stars just like our own. This photograph blows my mind. It is so impossible to grasp. It makes our often assumed uniqueness in the universe seem absurd. This photo is the principle inspiration for my series Deep Field." Gareth: "Toronto's High Park is home to one of the most beautiful places in the city, Grenadier Pond. This pond inspired much of the "Lament" paintings series and is the location for my photographs Winter on Grenadier Pond and plastic painting Self-Portrait Installation. It is a location I continually return to for inspiration." Gareth: "I think this is possibly one of the all-time greatest moments in film. This film is so unbelievably beautiful and moving. The music is also fabulous. To me this scene is like a ballet." Video: In the Mood for Love by Wang Kar-wai. Starring Tony Leung and Maggie Cheung. Music by Shigeru Umebayashi and Michael Galasso. Gareth: "I would love to make paintings with the raw emotion and passion of Janis Joplin. What would that look like?" Video: Ball and Chain, Janis Joplin & Big Brother and Holding Company. Gareth: "I first arrived at 401 Richmond as the recipient of the "401 Richmond Career-Launcher Prize" a 500 square foot studio for one year. I have fallen in love with the building and find it truly visionary. This is Toronto at its best. The roof top garden and stunning court yard are secret, (yet public) Toronto gems. The building is based on urban ecologist Jane Jacobs philosophy of "New ideas require old spaces" and the need for mixed use and diversity. This old industrial building has been transformed into a vibrant home for artists studios, galleries, film festivals, charities, magazines, tailors, architects, theatre groups, book stores and design firms etc. It also has a wonderful cafe. I highly recommend a visit." Gareth: "If I have a hero it is Charles Darwin. Evolution is the single greatest idea that any human has ever had. It changes everything. I find evolution infinitely fascinating. I would love to make art about evolution but I have no idea what that would look like." Darwin: "There is grandeur in this view of life... whilst this planet has gone cycling on according to the fixed law of gravity, from so simple a beginning endless forms most beautiful and most wonderful have been, and are being, evolved." Gareth: "I was lucky enough to see Joan Baez live at Toronto's Convocation Hall on the day after the start of the Iraq War. I had just come from the massive protests downtown. She walked out and immediately sang "We Shall Overcome". It was an amazing moment. Joan Baez back in her element." Gareth: "Seeing Fellini's Nights of Cabiria was a wonderful surprise. I didn't expect to see such a profoundly moving film and a remakable performance by Giulietta Masina. She plays a naive Roman prostitute who is very unlucky in love. The ending is one of the most poetic, tragic and yet life affirming things I've seen." Video: SPOILER: The ending of Nights of Cabiria. Gareth: "Every time I see a Monet in real life I'm struck by how radical his painting is. I especially love the Rouen Cathedral series which captures the subtle shifts in colour and light on the surface of the cathedral in different weather conditions and times of day. They are so bold. In my imaginary dream role as curator of a large art museum, I would love to reunite all the time-based work of Monet. So all the Rouen Cathedrals and all the Hay Stacks." 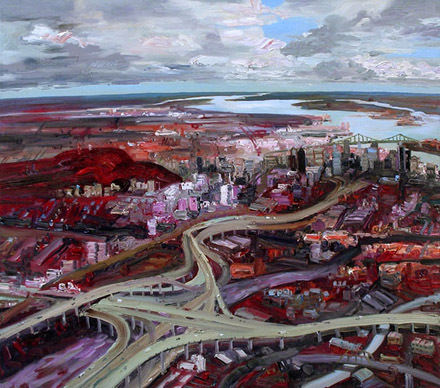 Gareth: "Canadian artist John Hartman's city painting really capture my imagination. He flies over cities around the world and creates fabulously expressive paintings. I especially love the watercolour preparatory sketches." Photo: © John Hartman, Montreal. Gareth: "Nothing beats a trip on Toronto's Queen or Spadina Streetcars. They are the most iconic thing about Toronto. Sure, rush hour isn't fun, but other than walking there is no better way to see the city than to ride all the way from the west end to the beaches on the Queen car. Sadly in a few years they will be phased out in favour of light rail transit (which will be great) but it will be sad to see the end of Toronto's streetcars. " 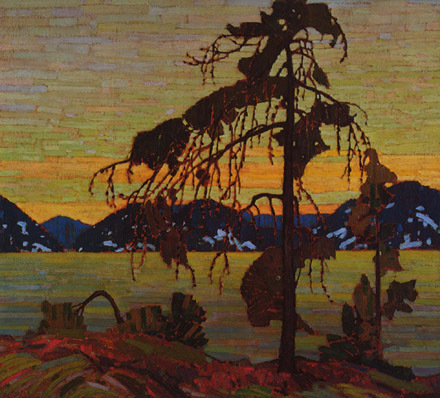 Gareth: "Canadian pre-Group of Seven painter Tom Thompson's sketches of Algonquin Park are a marvel. They are remarkably vibrant and evocative. He is the best of the bunch. 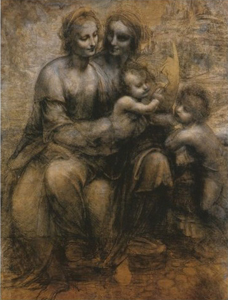 It is nice to see the Art Gallery of Ontario put their sketches front and centre where they belong. Something is always lost when they scale up for their studio paintings." 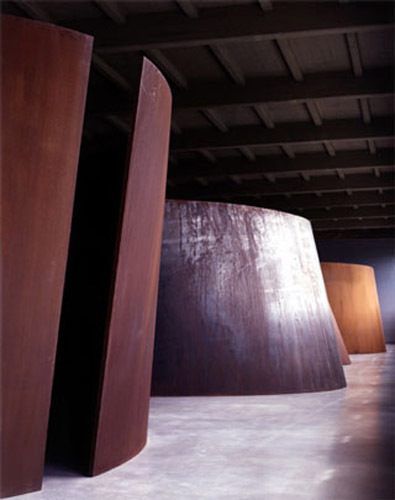 Gareth: "The experience of being inside Richard Serra's Torqued Ellipses at the DIA: Beacon, in New York state had a profound influence on me. It was the closest I have come to a sublime experience. The sound in the room echoes and gives the sense that these gigantic steel structures are about to collapse. It was incredible powerful to surrender to the fear and embrace it. A very moving experience. Interestingly, when I saw the Richard Serra show at the Museum of Modern Art, the atmosphere of the room was brightly lit and in a white gallery space. The work did not resonate with me on the same level. " Gareth: "What an amazing painter. Every time I see a Van Gogh painting I am deeply moved. Every brush stroke has an intense sense of spiritual purpose." Image: Starry Night: Van Gogh, MoMa, New York. Gareth: "This is another one of my all-time favourite film moments. So amazing." Video: La Dolce Vita by Federico Fellini. Starring Marcello Mastroianni and Anita Ekberg, 1960. Gareth: "In my first year as an art student I saw the film The Lion in Winter. It was a revelation to see Eleanor's Arrival. I was struck by the remarkable beauty of the brown and gray colour scheme. I had never seen brown as beautiful before and this was an awakening to a more sophisticated sense of colour. The music is also amazing in this film." Video: Eleanor's Arrival in The Lion in Winter. Starring Katharin Hepburn. Music by John Barry. Gareth: "I love BBC literary adaptations. North & South is in my opinion the all-time greatest one. This scene is so perfect. I also highly recommend Bleak House (2005), Sense & Sensibility (2008), Pride & Predjudice (1980), Our Mutual Friend (1998) and the original Forsythe Sage (1967)." Video: North & South: Directed by Brian Perciva., Staring Daniela Denby-Ashe and Richard Armitage. Music by Martin Phipps. Ann Hamilton writes in Buddha Mind in Contemporary Art: "Sometimes something else is too much, still overloaded with intellectual attachments. Sometimes is it too subtle to come into presence. Sometimes I wonder how little one can allow oneself to do our impetus “to do” gets in the way of our listening to what is necessary, our impetus “to say” barging in front of listening. I wonder if this emptying out means leaving…or preparing for something else. And might I recognize what that something else is…or will I be too afraid too leave form? When we are confronted with work that is not an object with fixed edges and form but a work which is the experience of our body as it inhabits space, it is very difficult for us from a Western philosophical tradition to see reality as made up of something that is not, in some way, an object…for us to recognize presence, absence, or emptiness as something." 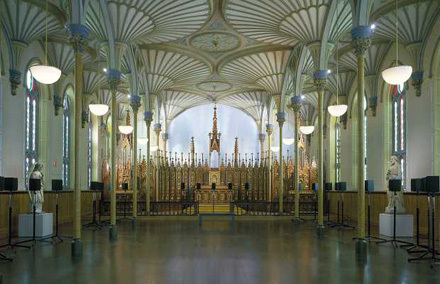 Gareth: "Over the last few years all of Toronto's cultural institutions have been transformed. I have found watching the construction of these buildings very inspiring. My favourites include OCAD's "table top" on coloured stilts, the new Art Gallery of Ontario and the interior of the new Opera House. Thank god it happened before the Great Recession!" 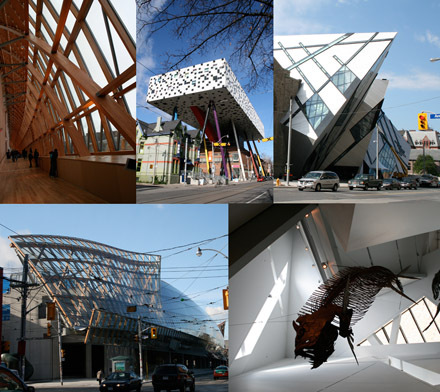 Photos by Gareth Bate: Frank Gehry's Art Gallery of Ontario interior, Will Alsop's Ontario College of Art & Design, Daniel Liebeskind's Royal Ontario Museum, AGO exterior, ROM interior. 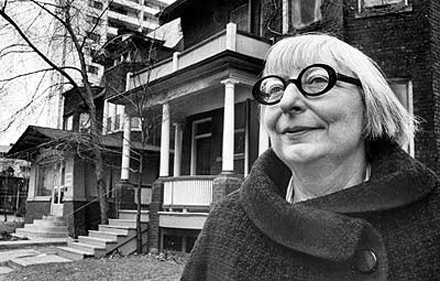 Gareth: "I've long been an admirer of Jane Jacobs and her philosophies of urbanism and economics. I love her ability to actually SEE what is happening in both the urban environment and the economy as she takes nothing at face value. Everything must have observable evidence. I admire her powers of observation. She predicted the housing crisis way back in 2006." 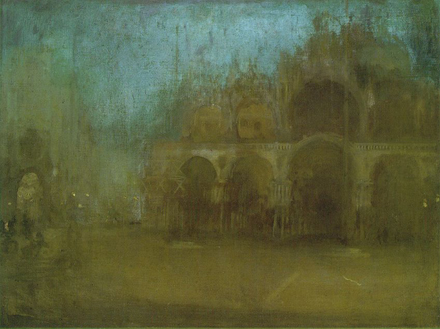 Gareth: "Whistler's paintings and drawings of Venice are remarkable. My first experience of them was the fabulous "Turner, Whistler, Monet" exhibition at the Art Gallery of Ontario. The simplicity and restraint is truly inspirational." Gareth: "Ghanaian artist El Anatsui's sculptures are truly amazing! I was very lucky to see them in real like at the Royal Ontario Museum." Photo: Gareth Bate, El Anatsui piece in the permanent collection of the Royal Ontario Musuem, Toronto. Gareth: "There is something very special about Canadian song writers. There is a distinct emotional rawness that I really admire." Gareth: "Another great Canadian song writer is Jane Siberry. She has written some truly beautiful songs and I think is undervalued." Song: Journey Through The Past.